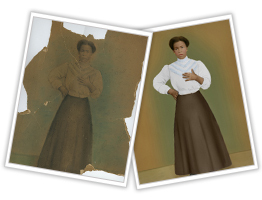 We regard photo restoration as an art. When done properly, it is the product of an artist's enthusiasm for the process and a craftsman's dedication to nuance and detail. We take pride in our work and consider it a compliment when people trust their precious family heirlooms to us. We go the extra distance to ensure that you are not disappointed. We first scan the photo and optimize the contrast, sharpness and brightness. This allows us to see what the image really contains - both good and bad - and allows us to estimate how much work and cost will be involved in fixing it. At this point we will call you with a firm estimate and strategies to reduce cost if it appears likely that we cannot stay within our initial estimate. Please be aware that even with the best of equipment and the highest skill level, the sharpness of the original photo does limit the potential quality of the finished product. While we can create patches and clone existing material to insert in damaged or missing sections, if a significant part of a face is missing or badly blurred it may not be possible to invent such detail. 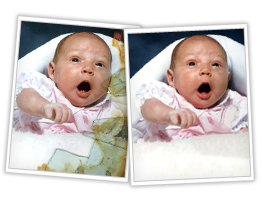 Even then, if there is another photo of that same person it is sometimes possible to "clone" eyes, a nose or lips from a "donor" photo you may have to complete the puzzle. 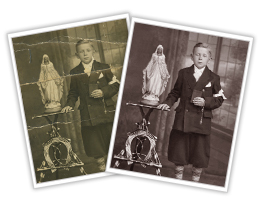 That said, the best way for you to determine the potential of your treasured photograph is for you to bring it in for us to examine. It will be our pleasure to give you an honest appraisal and a fair price. 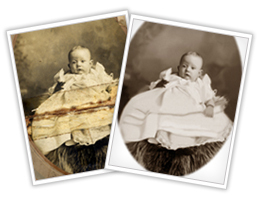 If your original is an unusual shape or larger than 8x10, we may need to produce a copy negative to scan ($10.00). The copy negative allows us to retain maximum detail. Please see us with questions or to order additional prints and enlargements.